Flag and Pennant patterns are continuation chart patterns within the technical analysis that do not differ from each other very much. The only distinction is the shape of consolidation. The flag has its consolidation in the form of rectangle and pennant in the form of a triangle. That’s why these two terms are used together very often. The flagpole represents usually a sharp trending price increase, which needs to be supported with heavier volume. The flag represents a sideways movement of the price that goes between support and resistance lines forming a rectangle(in a case of the pennant – triangle). More tight the flag is more performance is expected when the pattern completes. During the development of the flag, it is expected that volume decreases slightly or moves on average levels. The flags wave sloping upward, horizontally or downward. Those that wave down tend to perform the best. The breakout faze represents a price pierce through the highest price level with increased volume(does not need to be significantly heavy volume). 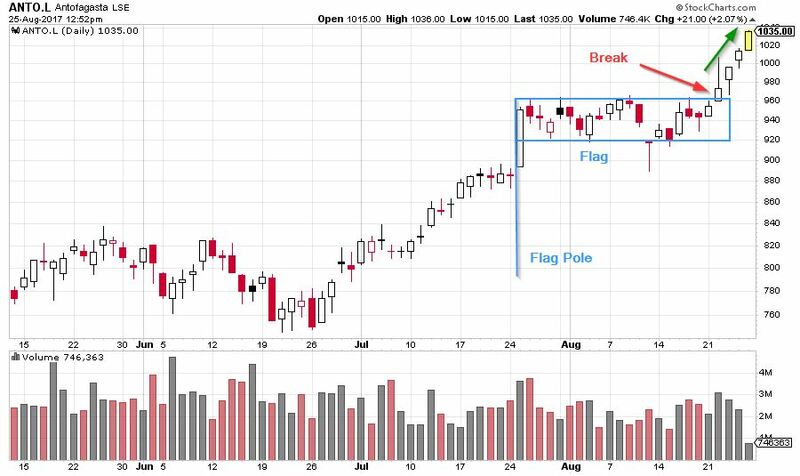 In a case of the downward sloping flag, it is not a break through the resistance line – it is still the highest point, which is top of the flagpole. It is very important to wait for the breakout since failure in breakout would mean invalid pattern and cease of continuation. The traders with a high-risk appetite can enter the position at the break of resistance, however, a price behavior must be closely watched when approaching the flagpole top whether it doesn’t bounce down. The effective compromise might be closing the position at this level and then entering it again if the breakout is completed. Duration of Flag and Pennant (all three stages) is short-lived between 1 week and 2 months. Longer than that would classify as a different pattern (rectangle or triangle) or no pattern. After the break when a long position is taken, a successful trader will drive the price until its current trend is broken based on trend line analysis. Above example of Antofagasta needs no extra commentary. It is a great model of flag and pennant theory.